1. Number of trees planted by NGO-Dayavan in the Odisha in the year 2007 was approximately what percentage of the number of trees planted by NGO-Aarambha in the Kerala in the year 2009? 2. Which NGO planted the second highest number of trees in both the states together in the year 2009? 3. What was the approximate percentage decrease in the number of trees planted by NGO-Chitsukh in Odisha in the year 2007 as compared to the previous year? 4. What was the average number of trees planted by NGO-Chitsukh in the Kerala over the years together? 5. What was the respective ratio between the number of trees planted by NGO-Aarambha in the year 2006 in Kerala and the number of trees planted by NGO-Energy in the year 2008 in Odisha? 6. 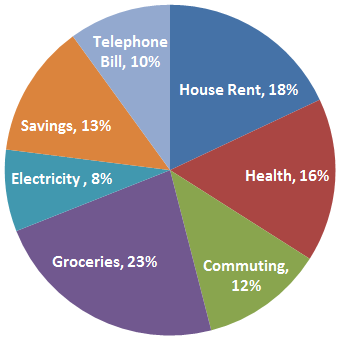 Total amount spent by the family on Commuting and Telephone Bills together forms approximately what per cent of the amount spent on Groceries? 7. Amount invested by the family on Savings forms what per cent of the amount spent on Health? 8. What is the ratio of the amount spent by the family on Groceries to the amount spent on House Rent? 9. What is the total amount spent by the family on Telephone Bills, Health and Electricity together? 10. What is the amount spent by the family on Commuting? In St. Mary University, the first year is a foundation program for all the students after which in second year the students can opt for their major subject. In 2013, only 70% of the students passed the first year examination and all of those who passed joined in the second year. In 2013, only 20% of students of first year who passed the first year examination joined Physical Sciences, 30% joined the Arts stream, while remaining joined Commerce stream. Apart from these some students from other Universities who passed their first year also joined St. Mary University. Such students were 20% of the number of first year students from St. Mary University who passed 2013 examination. The break-up of the number of students from other universities across Physical Sciences, Arts and Commerce streams at St. Mary University was in ratio 2:3:5 respectively. In 2013, the number of students in Arts stream in St. Mary University in second year was 504. 6.How many first year students of St. Mary University appeared for the first year examination in 2013? 12. What was the number of students in second year Commerce stream in St. Mary University in 2013? 13. In 2013, what percent of science stream students in second year at St. Mary University were first year pass outs from St. Mary University only? 14. If after second year, 10% of Commerce stream students changed to Physical Science stream then what would have been the number of students in third year in Physical Science at St. Mary University in 2014? (Assume no outside student was admitted to third year and no student failed in second year examination in St. Mary University)? 15. If the number of girls in second year at St. Mary University in 2013 are distributed in the ratio 2:5:3 across Physical Sciences, Commerce and Arts streams respectively, then what is the number of the girls in second year in 2013 at St. Mary University? 13. B) Total Science students in St. Mary University= .14p + .028p = 336students. 15. E) No bifurcation of students among boys and girls is given.